Melt butter in a saucepan over medium heat. Add salt and butter and cook until incorporated over low heat. Remove from heat and let cool slightly. In a small bowl combine cornstarch with 1/2 cup of the milk and whisk until cornstarch is dissolved. Whisk in the eggs. Pour the remaining 2 cups of milk into brown sugar mixture and whisk until combined. Pour a couple of tablespoons of the brown sugar mixture into the egg mixture and stir to combine. This tempers the egg mixture so that it does not scramble when added to the warm brown sugar mixture. Add entire egg mixture to brown sugar mixture and whisk to incorporate. Return pan to the stove and start cooking on low heat. Bring mixture up to a boil stirring constantly. Once it is reaches a boil, reduce heat and continue to stir for about a minute. Pour into 6 ramekins and chill for 1-2 hours. Sprinkle each serving with a little sea salt before serving. Back in November I was lucky enough to visit the General Mills headquarters and hang out with some of the fun people over at Tablespoon. While I was there, we did our fair share of eating and hit some local restaurants. One night out, after an amazing dinner, we were all deciding what to get for dessert. That’s what I love about hanging out with other “foodies”…it wasn’t a matter of IF we were ordering dessert, the question was WHAT were we ordering for dessert. I always like to ask the server for a suggestion. Out of all the desserts on the menu, our waitress recommended a salted butterscotch pudding. I kind of hesitated but decided to go with it. When dessert came we all passed around our desserts, family style, so we could all taste what the restaurant had to offer. The salted butterscotch pudding was definitely the favorite. I thought I would give it a go at recreating the dessert from that night. This Salted Butterscotch Pudding is sweet and creamy with an occasional bite of sea salt to bring out all of the flavors. It’s completely different from a boxed pudding mix so don’t even try to compare the two. Homemade pudding is lighter with more subtle flavor than the overbearing sweetness of a boxed pudding. This pudding is made with simple ingredients that can be found in your pantry and can be whipped up in about twenty minutes. 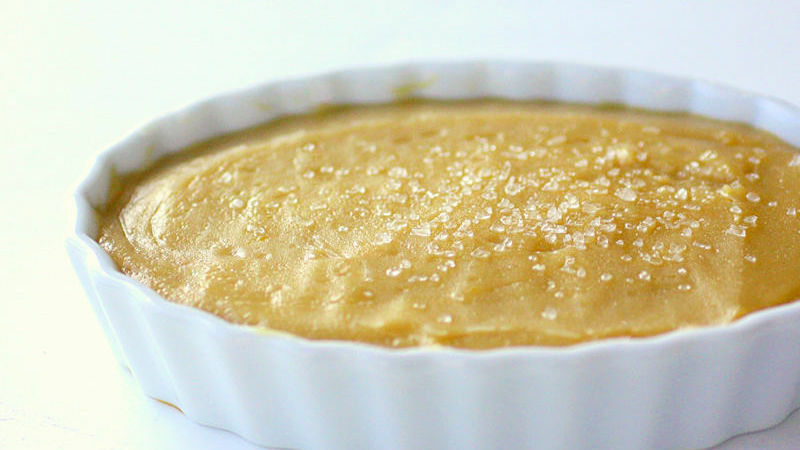 This Salted Butterscotch Pudding is comforting and easy homemade dessert in no time at all.